It's always interesting to do some detective work on which rarely seen jewellery piece comes from where. 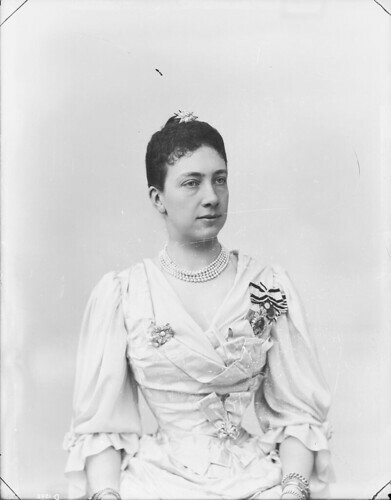 I was trying to find the aquamarines that Margaret of Connaught had (at least one is worn by Anne Marie of Greece as a necklace and Lilian had at least one as well) and I stumbled onto something else. Could these be the earrings that Princess Sibylla is wearing here? They might have been modernised later but look the same to me. Did Madeleine receive Sibylla's earrings at some point? I couldn't find pics of anyone else wearing the earrings so I guess they were Sibylla's originally or she inherited them from her family. 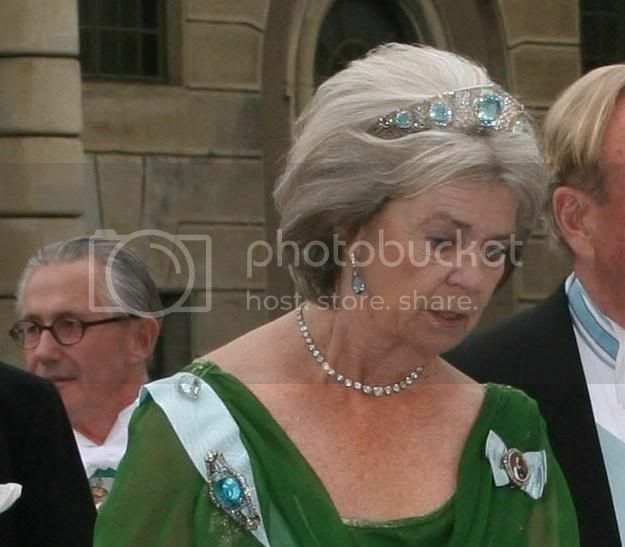 Margaretha occasionally wears aquamarine earrings (with Margaret's tiara) but they look different. 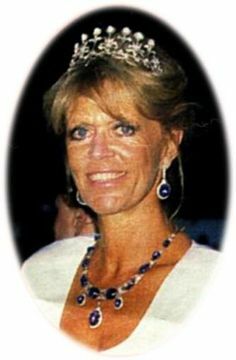 The necklace Sibylla is wearing in the picture with the earrings and the Connaught tiara is a sapphire necklace and Birgitta inherited it. To me it seems as if Madeline and Birgitta has different earrings from Sybilla. Madeleines blue stones are to die for! So beautiful, would not be suprised if Chris bought them for her, thinking of her eyes. Darling Suzerain, your dancing moving banners are hard for the eyes. I have newly operated both my eyes and it makes it hard to read your posts, which are always witty and interesting to read. Maybe I am not alone with this problem? 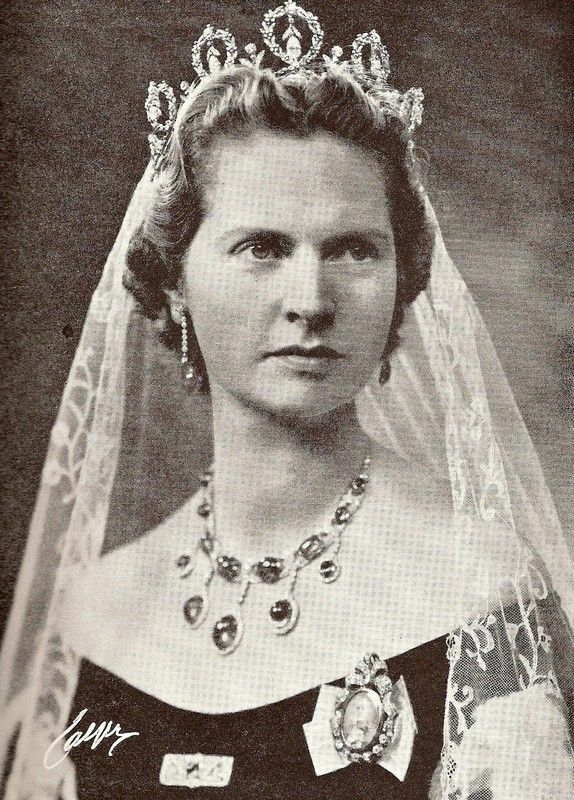 I believe Sibylla's necklace and earrings (sapphires) were wedding presents from Tsar Ferdinand of Bulgaria, who was a Saxe-Coburg prince by birth and spent his exile mainly in Coburg. I don't think Sibylla's earrings in that portrait are the same though. Birgitta is wearing different earrings, Margaretha is wearing different earrings, Madde is wearing copies...? I think the earrings Madde is wearing look the same. They might have added a diamond and modernised the earring findings/posts. Maybe I should check the royal jewellery message board... Maybe they know more. I had no idea that Birgitta's saphires came from Sibylla. 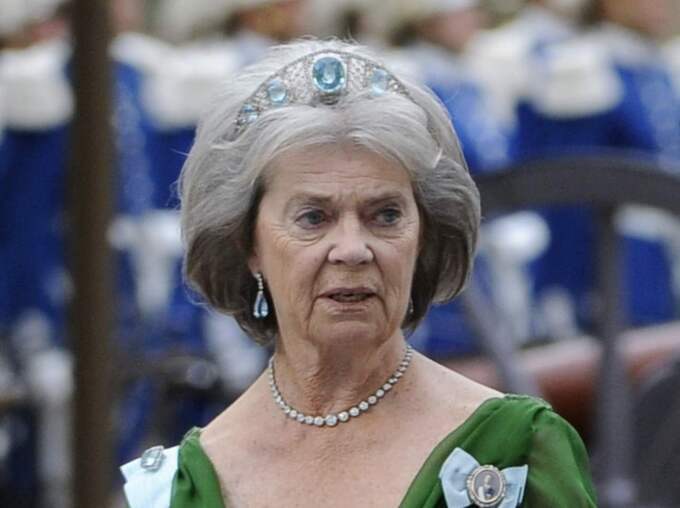 It looks like Birgitta had two of the sapphires hanging from the necklace made into earrings. I always thought Maddes earrings were a wedding gift from Chris, she also switches out the aquamarine for pearls. Maybe she had those made after the ones Sibylla had? Or then they've made the old earrings into ones where you can change the stone. Antique jewellery is often modifiable too. They look like two different pairs to me. Maddie's have (if my old eyes are counting right) 8 diamonds before the bottom stone/pearl, while the other earrings have maybe 6 diamonds and the diamonds seem slightly smaller too. I know this doesn't add any information to the origin of any of the jewels however, I would happily wear any piece, any time. I love those pearl drops that Madde wears! Does anyone know about this brooch (?) that Ssss wore with her ice capades dress? I think it was 2014, before she and CP married. Has she worn it again in public? I think Snakey's brooch is costume jewellery. Haven't seen her wear it since. That tacky attempt at covering up her tattoo just catches your eye doesn't it? I wonder why they even tried. She's made it very clear she's proud of that cheesy scribble. Answering my own question... seems Benedikte owns the stars now. 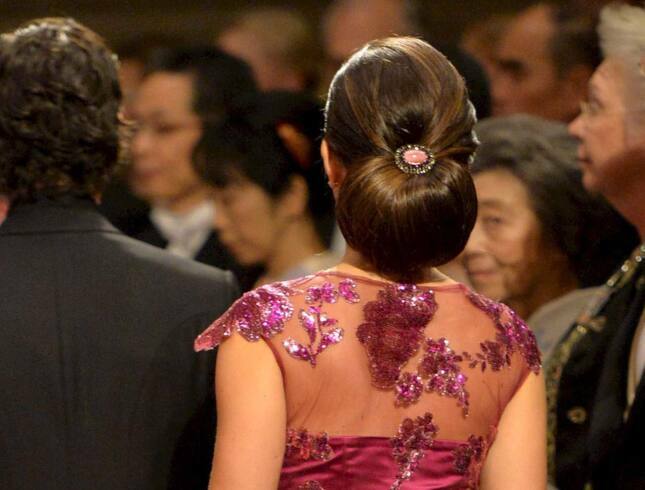 What bracelet was Snaky wearing on her right arm at the Nobel dinner? Does anyone have a better photo?